How does The Banner Saga begin? It begins on the run. The gods are dead, the sun has stopped in the sky, and the age-old enemy of both men and giants – the dredge – are swarming down from the north. 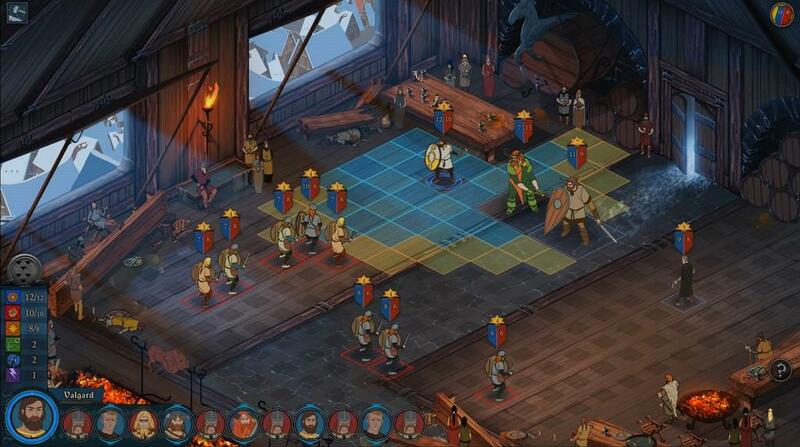 For the men and women of The Banner Saga, it’s going to get worse before it gets better. Beauty and brutality are the watchwords here, while strategy and story weave it all together. The Banner Saga: Chapter 1 is the first part of a planned trilogy of role-playing strategy games, and already chapter one is a blockbuster of an opener. If you picture The Oregon Trail twisting through Skyrim with conflicting Mass Effect companions, then you’re on the right track. The turn-based combat takes inspiration from 1990’s strategy games like Final Fantasy Tactics and Shining Force. Fielding a team of up to six combatants, fights take place in rectangular, grid-lined battlefields. Sometimes battle breaks out atop city ramparts or in snow-drifted fields of cracked ice. Other times, war kicks in the doors of mead halls or splays itself across abandoned farmsteads. Occasionally hearth fires split a room to create a tangible hazard for your party, or an impassable precipice redirects your usual straightforward tactics. More often than not, however, the chess board you play on is wide open. You move one character, then the enemy moves one character. Properly assigning each of your character’s places in line is crucial. Figuring out whether to lead off with shield-bearing giants or wrap things up with eagle-eyed archers (or otherwise, considering the various units) makes for excellent trial-and-error territory. I discovered a variety of solid approaches. I also discovered several bad ones. Thankfully, The Banner Saga never forced my hand into using one set of tactics over and over. 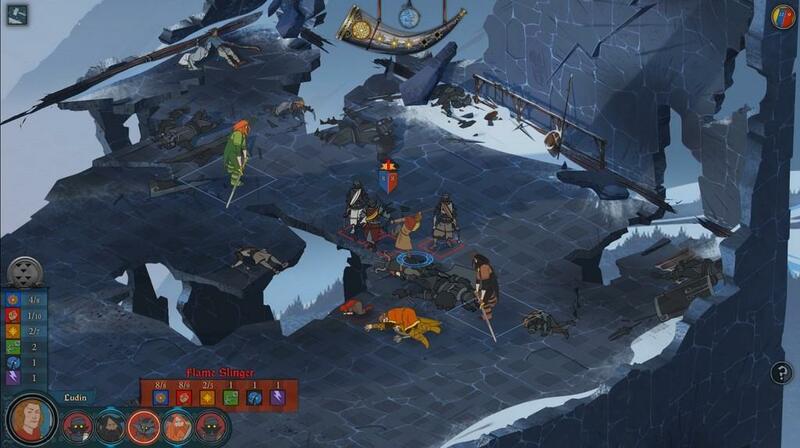 The twist on The Banner Saga's tried-and-true turn-based system, though, is strength. Your hit points and your actual hitting power are both tied to this singular strength stat. So, as your hit points go down, so does your damage output. It makes a lot of sense. If you’re beaten to within an inch of your life, it stands to reason that you couldn't physically be hitting someone else at full strength. It’s a design choice that changes the old tack of focus-firing enemy units to death because (in most other strategy games) an enemy unit with a million hit points or only one hit point can still dish out maximum damage. Not so here. In The Banner Saga, there are times when leaving a completely battered and bruised – but still standing – enemy unit on the board can serve your purposes. Perhaps that nearly dead enemy is a suitable barrier between you and a nastier opponent behind him. Perhaps it's a crucial piece of the puzzle as you ready your magician’s chain lightning spell to bounce off him and several other enemy units. 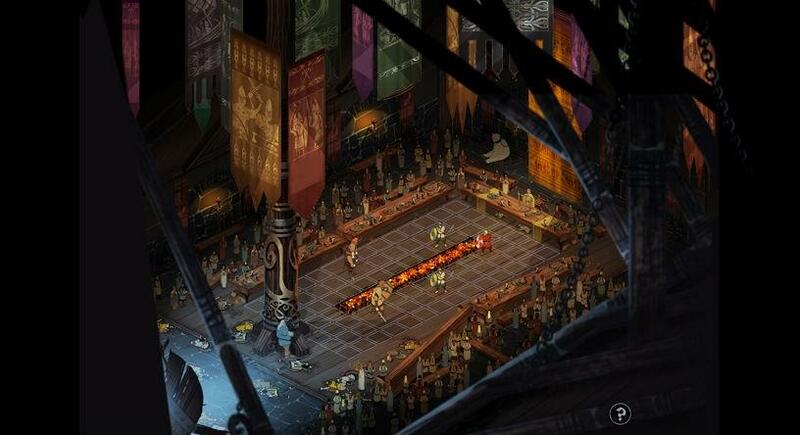 How The Banner Saga handles strength is a game changer. Your frequently shifting party of humans and giants find themselves thrust together in this new war to end all wars. The peace between man and giant has always been tenuous, but now it will be tested. Lite role-playing elements have you fight dredge to gain renown – the currency of The Banner Saga. With renown you promote characters to higher levels, bump up ability scores, purchase combat-buffing trinkets, or replenish food stores. But losing doesn’t mean all is lost. The game encourages you to accept the tough but fair consequences of losing a fight or two along the way. Win or lose, the story marches onward, your characters licking their wounds, while you garner at least a little renown for your actions. Not as much renown as winning, of course, but, again, The Banner Saga is designed to have you win some and lose some when it comes to throwing down with the dredge. The dredge are a smart enemy. They bide their time. They strike at the weak. They perform both full frontal assaults and strategic retreats. They flank and they feint. While not omniscient, the dredge are a worthy opponent. They also confound the defined borders of war with their guerrilla tactics and ethically questionable troop selection – which taps into some difficult topics addressed in The Banner Saga. Difficult topics like females in combat. And, especially, is a combatant always a combatant, even if they're presently unarmed? What if that combatant is a mother, and that mother is presently nursing a child? What do you do with her child if you kill that combatant, that mother? It doesn't wallow in it, but The Banner Saga asks some scary questions. Events and conversation trees like those keep the narrative moving at an urgent pace. Between the interwoven storylines and white-knuckle battles, not to mention the increasingly mythological plot, it’s hard to find rest stops along the way. The miniature drama between your men and women, the nationalist drama between the humans and giants, and the overarching chronicle of both races herded along by the dredge makes for powerful storytelling. Some gameplay elements never gelled for me. As hundreds of my exiled peoples hefted their worldly possessions onto their backs, I never got comfortable gauging my caravan’s food supply. Nothing gave me a good feeling about how many mouths I had to feed, or how many days' march it was to the next town. That was all a guessing game, and many of my brethren starved and died during our exodus, probably because I spent renown on leveling up characters and +1 trinkets when I should've spent renown on food. But, as with counting losses in combat, I let their starvation become a part of my personal story through the game – I let it become a part of my particular banner saga. Sometimes, however, the story and the gameplay didn't match up. Some events had me sharing supplies with strangers and kinsmen, when I hadn't had any supplies for days or even weeks prior. I also disappointed myself. While the difficulty level may be lowered (or raised) at any time without adverse effects to the storyline, I’d refused. Because I’d refused, I'd slammed my head against the wall for hours (hours!) in the multistage end boss battle. The end boss encounter is one of only two battles in which a game-over screen pops up for a loss. So, an enemy that was heralded as unbeatable was truly, maddeningly unbeatable for me on normal difficulty. I kicked it down a notch, and the final encounter then became pitifully easy with drastically weakened enemies hobbling around their decimated ranks, while my combatants magically had their wounds healed without resting and their morale superficially boosted to help them on the field. Perfect if you’re no longer interested in the typically well-balanced challenge The Banner Saga produces. I can’t even imagine how impossible hard difficulty would play out though. The Banner Saga tries to conjure them, but I didn’t personally unearth any tear-jerking or laugh-out-loud moments. Oh it’s moving, and it can be funny. But most impressive is the game’s art and craftsmanship. The painterly countryside and handdrawn characters were cut from the same cloth as Disney’s Sleeping Beauty (1959). More specifically, from American artist Eyvind Earle who’s cited as an inspiration by the art direction team. The whole of The Banner Saga is an homage to Eyvind Earle’s work: there’s even an uncertain but determined character in the game named after him. And not enough can be said about the soundtrack. The orchestral score, architected by Grammy-winning composer, Austin Wintory, far outstrips his peers’ work in the video game sector. At times the soundtrack is all ghostly, monolithic, Gregorian chant, and at other times it’s pungent war drums and brass-spiked tempests. You may figure out that the unnerved feeling you have isn’t from your caravan’s dwindling food supply, but from a few hollow, dissonant chords. Those mountain vistas are majestic, sure, but the ethnic lyrics and spacious compositions make fearful creations of those same massifs and foothills. The dexterity and highly polished prose of the story is evident. The Banner Saga paid its writers, and it shows. At first the writing was too clipped, overly edited. But the dialogue and narration loosened its belt as things progressed, and they’d found a good spot early on and held onto it. It took a slower, more measured reading pace to acclimate to the cutscenes at first, however. Regardless, I'm impressed. I'll wait, albeit impatiently, for chapters two and three, to find out what compels the dredge invasion, what stopped the sun in the sky, and discover if the gods are well and truly dead. Distinctive writing, nuanced combat and impossibly beautiful art headline The Banner Saga. Strong workmanship went into the character builds. The rethought turn-based tactics are unique and sensible. And I just couldn’t slow down the insistent narrative of this brave world and the bold new legend it’s sewing together.